This week on The Bugcast: we have a fairly in-depth discussion about the “podcasting boom”, plus we play 8 amazing tracks of Creative Commons music from Neon NiteClub, Emily Richards, Seth Power, Thanks For Noticing, Bert Jerred, Lilly Wolf, Lorenzo’s Music, and Sam Garbett. This week on a rather chat-heavy episode of The Bugcast: misuse of domains and websites, misinformation, missing work, and 8 cracking tracks of Creative Commons music from Sam Garbett, Slingshot Miracle, Kevin S, Doc Aquatic, ISRA, Staff Only, Mickey Blue, and The Plecs. This week on The Bugcast: we look at safety education for pre-schoolers, we yarn about the new Jurassic World film we’re going to see tomorrow, and we play 8 cracking tracks of Creative Commons music from Falling Blind, Square A Saw, Kara Square and Piero Peluche, Quentin Hannappe, Dress Shop, Kwizat Haterach, Alicia Gwynn, and Sam Garbett. 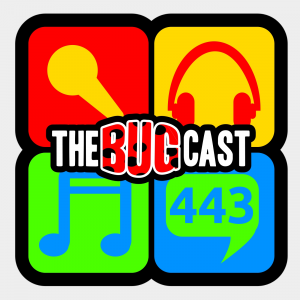 the bugcast 443 – Oh brothel! This week on The Bugcast: we discuss some of the television offerings of the New Year, plus 8 amazing tracks of Creative Commons music from Heifervescent, Sydney Leigh, Fabio D’Annunzio, Modona, Awesome Day, Sam Garbett, Color Out, and The Fourth Horseman.